Have you checked out the latest issue of Adore Home Magazine? It's a good one! It's the "New York Edition" and features some of the most stylish people and places in the big city. I was especially taken with the newly redesigned office space of Cameo Public Relations in Midtown Manhattan, designed by Nichole Loiacono of NL Designs. 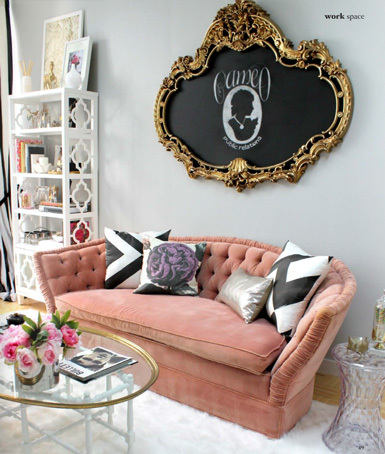 How adorable, chic and fabulous is this place?! The lovely vintage tufted sofa was snagged from Craigslist and the large sideboard (on left of room) was a freebie from the owner's aunt, which received a fresh coat of black paint to give it an instant update. Click here to check out the new issue and flip to page 49 to view the entire article on Cameo PR's office space. Do you love it as much as I do?! I need that gold mirror!!! the chandelier, the curtains, the sofa, the art.. yes! I love it as much as you do! 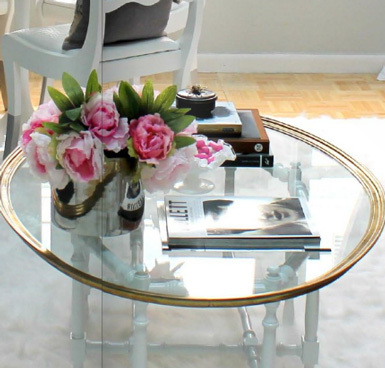 so chic, feminine and a bit glamorous! 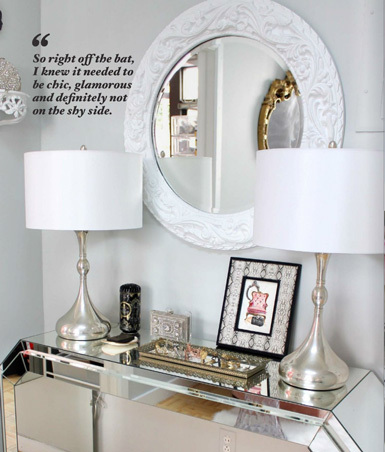 I loved this spread in Adore Home magazine as well! 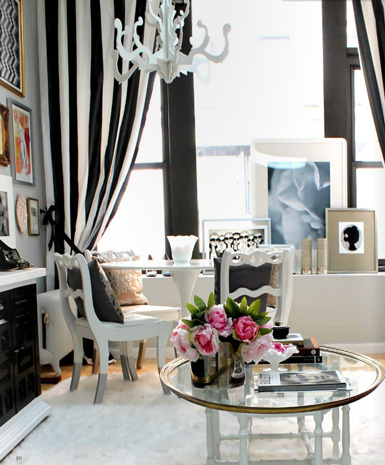 I just took a look at this space in Adore and I'm swooning over this gorgeous office apace! FABULOUS! Awwww, thanks so much for the kind words about this space. It was a ball to do, and luckily the client loves it as much as I do! BEAUTIFUL! I love all the furniture. It all works so well together. This space is stunning - I would love to call it home! I definitely love it as much as you do and who won't. The blend of colurs in the room is superb. I love the curtains and sofa for sure. The room has been given life with really small things, and the percision is admirable. It's the kind of space that anyone would sigh over! It looks so plush and inviting and that carpet looks like your feet would just sink into it! Omg this shoot is amazing!!! I love it. Where can you get this magazine from? I live in the uk. Home seems so clean and beautiful, All things are so much attractive but I like couch most.